This deal expired 3 days ago . Expired 3d ago . Last validated 4d ago . Used 8 times. Daniel Esparragoza I am re-activating this expired deal. Just enter promo code COIN at checkout to get the discount. There may be some exclusions that will apply to this deal. Offer valid until 4/20/19. carlos pinto I am validating that this deal works as described. Just type the promo code into the promotion code box and click apply to enjoy the promotion. Some exclusions may apply. Guillermo Garcia I am re-activating this expired deal. I will update it and validate that it works. 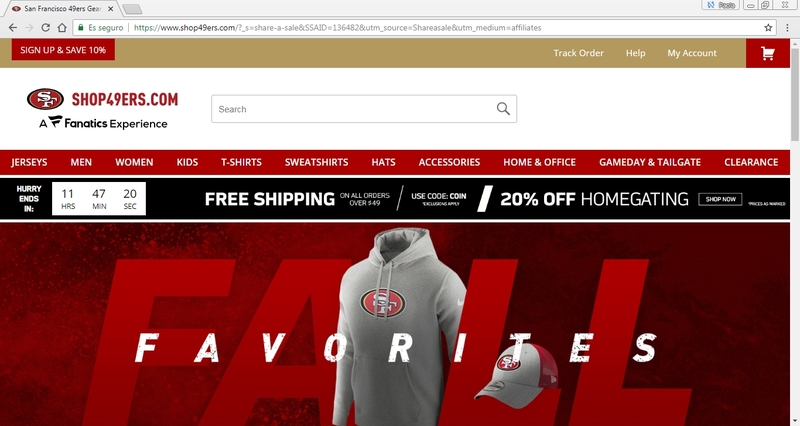 Free Shipping on Your Order of $49 or More at Shop49ers.com Site Wide. Simply enter the code during the checkout process to apply this discount. Paola Vanessa Briceño Araujo Go to Shop49ers.com and use this promotional code to get free shipping on your order of $49 or more. Just go and apply this coupon code in your shopping bag at checkout.